The feature we used to deploy a customized Start menu in Windows 10 has been extended with the ability to manage pinned items on the Taskbar. 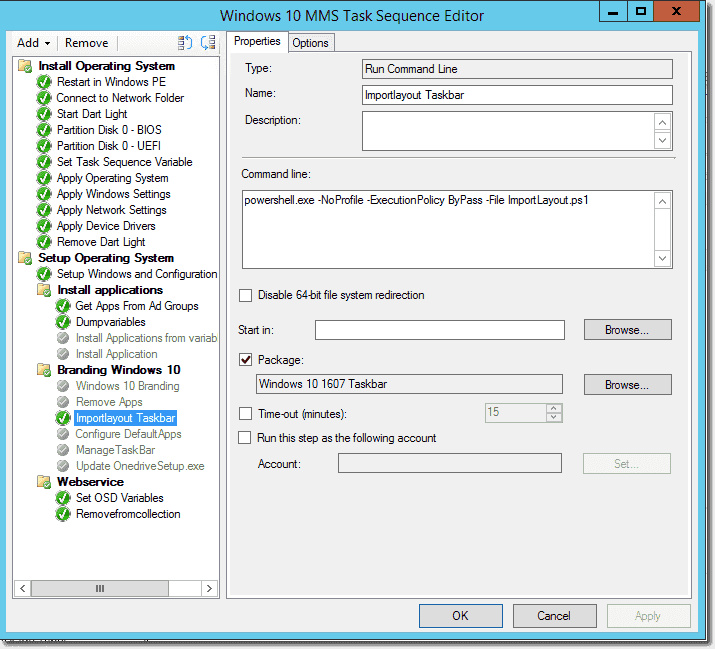 There are some unsupported solutions for importing a Taskbar layout during OS deployment. However, now we can do it in a supported manner, and we can even add items using Group Policy after we create the user profile. Note that this feature requires Windows 10 Enterprise/Education and it only works in Windows 10 1607. (Editor’s note: There is some evidence that this feature works in Windows 10 Pro. Please share your experiences in a comment.) 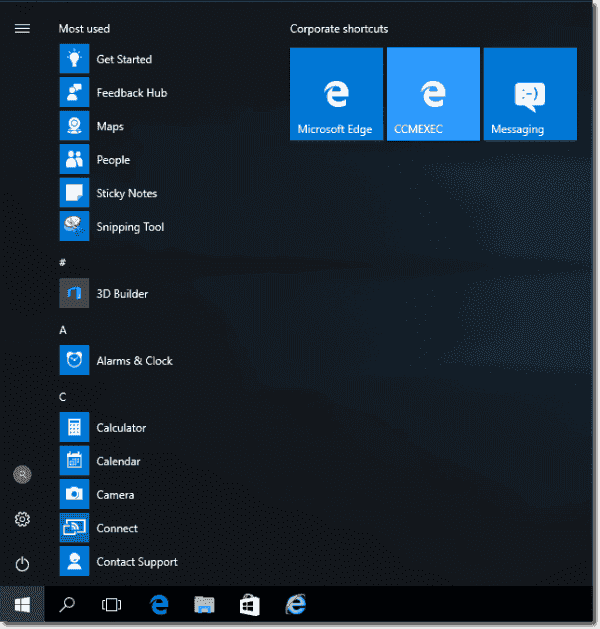 We cannot use this feature to remove items the user pinned to the Taskbar; we can only remove items from the Taskbar that we added with the new feature. The Taskbar layout is configured in an .xml file either together with the Start menu layout or in a separate file. The .xml file can then be deployed using different tools according to which suits your organization best. We have the option to either keep the default pinned apps (Edge, Store, and File Explorer) or delete them. If we delete them, we can add them back again using the same .xml file that we use to delete them. In my example, I have added the Messaging app and Internet Explorer to the Taskbar. To add a modern app, we need the AppUserModelID. 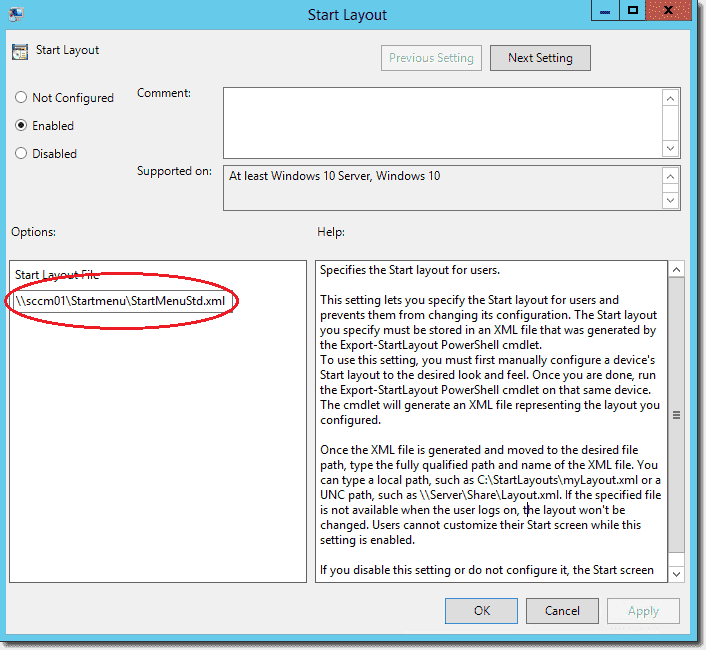 To find the ID, you can add the app to the Start menu and then use PowerShell to export the Start menu layout with the Export-StartLayout cmdlet to an .xml file. Add the modern app to the Start menu by right-clicking the Camera app and selecting Pin to Start. Launch PowerShell as standard user. Open the exported XML file using Notepad and copy the AppUserModelID. Then log on to the computer with a user account that has no profile on the machine, and the Taskbar modifications should be applied. Of course, you can use PowerShell to deploy the Taskbar with a script, and you can also use the above command during OS deployment, such as with Configuration Manager. Deploying a Taskbar layout during OS deployment with Configuration Manager is done exactly the same way as with the Start menu in Windows 10. You can simply add the information to the same .xml file that you use for the Start menu. Create a folder in your Configuration Manager package source folder. Copy the .xml file to be used during OS deployment to this folder. Create a package using this source folder. Distribute the package to the appropriate distribution points. We can also use a Group Policy to the Taskbar layout, which I assume will be the most used option because it allows you to change Taskbar configuration at any time. When the computer starts up, it will check if the .xml file has been modified and apply any changes. Copy the .xml file to a file share that domain members can access. Configure the Group Policy with the path to the .xml file. Note that the Group Policy enforces the Taskbar/Start menu layout on user computers. The .xml file is very sensitive to additional characters like an extra space at the end of a line. I recommend you try your .xml file as a local administrator with the PowerShell command explained above before you deploy it with Group Policy. If your .xml file contains syntax errors or illegal characters, you have the chance to get it right before you mess up the configuration on user computers. PowerShell validates the .xml file and writes results to c:\users\Default\AppData\Local\Microsoft\Windows\Shell\LayoutModification.xml. This allows you to detect possible errors.